All of the essays included in the present volume were written between 1995 and 2001. This attests to the timeliness and relevance of Dennis H. Wrong's writings. He notes that the mid-twentieth-century disposition to believe that politics fundamentally consisted of clashes between totalistic worldviews, such as communism, socialism, capitalism, fascism, nationalism, internationalism, and a cluster of "isms," may have been historically transitional. But politics now appears more nuanced, if no less troubled, following the collapse of the Soviet bloc between 1989 and 1991. Multiculturalism and identity politics, as well as communitarianism flourished in the 1990s. The volume is divided into five parts: "Capitalism--Inequalities and Alternatives," "Multiculturalism and Identity Politics," "Communitarianism," "Theory and Theorists," and "Autobiographical Reminiscences." This concluding part indicates how Wrong's work includes self-reflections as well as reflections--an examination of how figures such as C. Wright Mills and Raymond Aron, Amitai Etzioni, and Digby Baltzell, played a role in shaping his own thought, and how these changed over the course of the past century. This is the third collection of the essays and articles of Dennis H. Wrong published by Transaction. 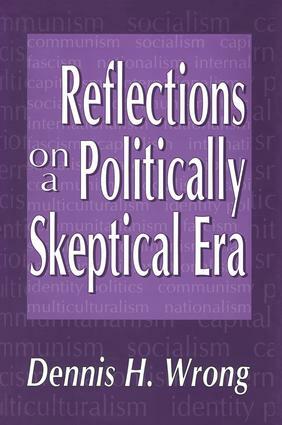 As was the case with his earlier volumes, Reflections on a Politically Skeptical Era is characterized by a deep attention to the actual social history of our times, and how this plays out in academic pursuits--especially within sociology. Whether the works were published in academic journals or more popular media, they reflect a quality of literary manners that is rare among social science writings, but a reflection that never sacrifices a sense of principle and probity in the process. Fated to be a Professor?